At the invitation of the government of China, Her Royal Highness Princess Maha Chakri Sirindhorn of the Kingdom of Thailand will visit China from April 4th to 11th. Q:According to reports, on March 26th, a Chinese citizen was shot dead by French plainclothes police in his home in Paris. After that, a group of overseas Chinese living in France rallied in front of the local police office and had some clashes with police officers. What is your comment? Has China made representations with France? What measures has China taken in response? A: On the night of March 26th local time, a Chinese citizen was shot dead by French plainclothes police in his home in Paris. Some overseas Chinese living in France rallied in front of the local police office and had some clashes with police officers. 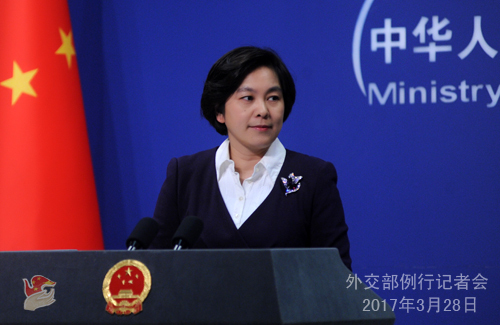 Upon learning the incident, the Chinese foreign ministry has placed high importance to it and instructed the Chinese embassy in France to activate its emergency response mechanism. The embassy immediately lodged representations with the French side and asked them to establish the truth as soon as possible, take concrete and effective measures to protect the safety and lawful rights and interests of Chinese citizens in France, and treat the reactions of overseas Chinese rationally. The Chinese embassy in France has sent officials to visit and console the family of the deceased and offered relevant assistance. Competent department of the Chinese foreign ministry has made representations in emergency meeting with officials of the French embassy in China today and will closely follow the developments of the incident together with our embassy in France, so as to effectively protect the safety and lawful rights and interests of Chinese citizens and institutions in France. We also hope that our fellow Chinese in France can express their concerns and demands in a reasonable and legal way. Q: A US think tank reported that new satellite imagery showed that China had completed the construction of facilities on some of its new airfields in the South China Sea and is likely getting ready to deploy fighter jets on these airfields. Is China going to deploy fighter jets on these airfields in the South China Sea? A: For the US think tank report you mentioned, I am not aware of the details. China has stated many times that the Nansha Islands are its inherent territory. China's purpose to construct facilities on its own territory is to improve the living and working conditions for the personnel stationed there, to better defend its sovereignty, to strengthen the capacity of relevant islands and reefs for providing civil and international public services, and to allow China to better perform its international obligations. As for whether or not China deploys necessary national defense facilities on its own territory, it is within the scope of China's sovereignty. It is also a right to self-preservation and self-defense to which a sovereign state is entitled under international law. Q: The Australian government has suspended its efforts to ratify the extradition treaty with China. What is China's response? A: An early entry into force of the China-Australia extradition treaty serves the interests of both China and Australia in that it would provide institutional support for the two countries' joint efforts to fight transnational crimes and help enhance our judicial and law enforcement cooperation. China-Australia relations are now enjoying a good momentum of development in general. We hope that the Australian side will bear in mind the bigger picture of China-Australia relations and continue to proceed with relevant domestic procedures so that the treaty can come into force at an early date. Q: It is reported that the Spokesperson of the President of the Philippines said on March 27th that the Philippines and China may start discussions on a bilateral mechanism on the South China Sea this coming May. Can you confirm and give more details? A: On the basis of the important consensus reached between the leaders of China and the Philippines, the two sides agreed during the 20th round of Sino-Philippine diplomatic consultation last January to establish a bilateral consultation mechanism on the South China Sea issue, with the two foreign ministries as the coordinators, to discuss issues of mutual concern and promote maritime cooperation and security. The Chinese side has invited competent officials of the Philippine foreign ministry to visit China in May for the first meeting of this mechanism. The two sides are having friendly consultations on the specifics of relevant matters. The Chinese side is willing to further strengthen communication and dialogue with the Philippine side to properly manage differences, enhance maritime cooperation and create a favorable atmosphere for practical cooperation between the two sides and the healthy and steady growth of Sino-Philippine relations. 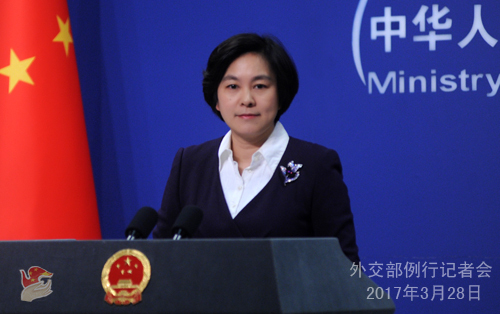 Q: According to media reports, the Spokesperson of the President of the Philippines also said on March 27th that the Chinese Ambassador to the Philippines Mr. Zhao Jianhua expressed to President Duterte China's hope to reach a new agreement when a Philippine coast guard delegation visits China, as a step to ensure that the South China Sea becomes a sea of cooperation. Can you confirm and when will this Philippine coast guard delegation visit China? A: Last February, China and the Philippines held the inaugural meeting of China-Philippines joint coast guard committee for maritime cooperation, during which the two sides agreed on a list of cooperation projects for 2017 through friendly consultation. The list includes high level visits, visits by vessels and ships, joint exercises and capacity building. According to China coast guard, the Chinese side has invited the Philippine coast guard to send a delegation to visit China at an early date. The two sides are communicating on the specifics of relevant matters. We believe that cooperation between the two coast guards will help deepen mutual trust and friendship between China and the Philippines and give impetus for the healthy and steady growth of bilateral relations. Q: The body of Kim Jong-Nam is possibly soon to be transported back to the DPRK via Beijing. Can you tell us if the Chinese government is in communication with the DPRK and Malaysian governments about the transport of the body? Is the Chinese government currently facilitating talks between the DPRK government and the Malaysian government over this issue, specifically over the issue of the Malaysian diplomats in Pyongyang and DPRK diplomats in Malaysia? A: I have seen quite a lot of media reports about talks between the DPRK and Malaysia over the issue you just mentioned in recent days. I am not aware of any details. We hope relevant sides can properly resolve relevant issues through dialogue and consultation. Q: China and Canada agreed to begin talks towards an extradition treaty. Now that Australia has shelved ratification of its treaty. Some in Canada are questioning whether it is wise for Canada to pursue an extradition treaty based on the same fears. What is your response? A: Discussions on signing extradition treaties and their implementation will help strengthen judicial and law enforcement cooperation between relevant countries and provide institutional guarantees for their joint fight against transnational crimes. It would serve the interests of both sides. We hope the relevant sides, be it Australia or Canada, can proceed from the bigger pictures of bilateral relations with China and press ahead with their domestic procedures so that we can enhance judicial and law enforcement cooperation and fight transnational crimes more effectively. Q: There have been lots of calls from China on the EU to recognize China's status as a market economy. Is this still a priority for the Chinese government? Does China hope that the EU can recognize China as a market economy as soon as possible? A: China has always valued the role of the EU in international affairs. Although the integration process in Europe is now faced with many difficulties and even setbacks, China has repeatedly stated its support for the integration process, its hope to see a united, stable and prosperous Europe and its willingness to work with the EU to advance the four-pronged partnership. At the same time, as comprehensive strategic partners, we hope the EU can truly value the legitimate concerns and interests of China. You mentioned the issue of recognizing China's status as a market economy. We believe that the WTO members, including the EU, are obligated to honor relevant provisions of Article 15 of the Protocol of China's Accession to the WTO. It would also show that they abide by the law. 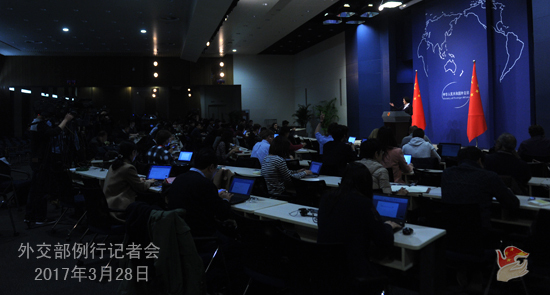 China will continue to resolutely defend its lawful interests in accordance with the rules of WTO. We also hope that the EU can honor its commitment as soon as possible and fulfill its legal obligations in full. Q: What would be the consequences for bilateral relations if Canada were not to pursue talks towards extradition treaty? Would it be considered a setback? A: I don't have an answer for hypothetical questions. We hope the two sides can continue to pursue talks toward an extradition treaty to enhance our cooperation in judicial matters and law enforcement. We value our ties with Canada and hope to see continued momentum for sound growth of bilateral relations. We will both benefit, why not go for it?